These eight flowering vines will produce colorful blooms all summer long and so make a great addition to your garden. However before planting any of these it is wise to check how they are suited to your location since two in particular can be rather too enthusiastic to the extent that they become invasive. All eight vines are described by Lauren Dunec Hoang in her article which I found on the Houzz website. Planting a flowering vine for summer can be a great way to attract pollinators, boost curb appeal with a cascade of flowers or cast some shade over an outdoor seating area. Here are eight summer-flowering varieties to keep an eye out for. Each one packs a punch with continuous flowers all season. For most climates (excluding hot desert areas), spring through early summer is the perfect time to plant. At the nursery, look for healthy, vigorous vines that are just beginning to bud. (Mandevilla spp. and hybrids)With showy flowers in a range of colors — from crisp white to sunset shades of bright red, pink and orange — mandevilla vines add a nice splash of color to summer gardens. They thrive in warm, humid climates. 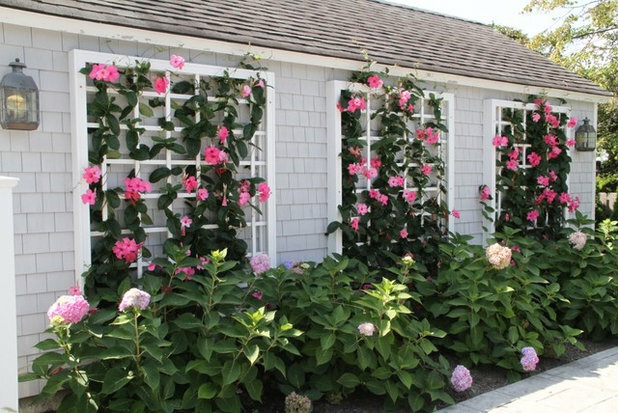 If you’re looking for a mandevilla to cover a trellis, don’t make the mistake of buying one of the dwarf hybrids — many never reach more than 18 inches tall. Instead, check the plant tag and make sure you have one that will grow into a true vine. Pink-flowering ‘Alice du Pont’ (Mandevilla x amabilis ‘Alice du Pont’) is commonly available and reaches at least 20 feet long. Caution: All parts of the vine are poisonous if ingested. 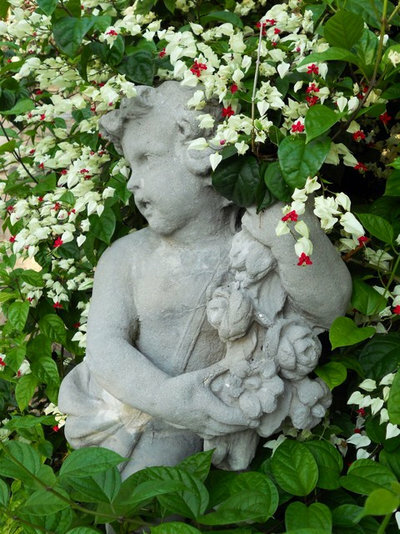 (Clerodendrum thomsoniae)Bleeding heart vine forms clusters of creamy white bell-shaped calyxes (the flowers’ leafy outer parts), each with a bright red star-shaped flower peeking through the bottom. The vines produce more flowers if given a water-soluble fertilizer throughout the growing season. Bleeding heart vine thrives in partial shade. Try growing one in a tree-dappled side yard or under a shade pergola. In cold-climate regions, move a potted plant indoors in winter or grow this vine as an annual.